Sundance, one of the most notable Film Festival in the world, a yearly phenomenon accommodating more than 50,000 attendees where movies are bought and sold as entertainment commodities for hundreds of aspiring filmmakers and actors. But just as popular as the silver screen presentations are the myriad of private parties, lounges and who’s who events that blanket the small town of Park City, Utah. Approaching it’s eighth year as one of the largest and oldest running lounges throughout the history of the festival, the #IndieLounge hosts celebrity highlife, influencers, the latest musical talents from around the world, and entertainers from across the globe. 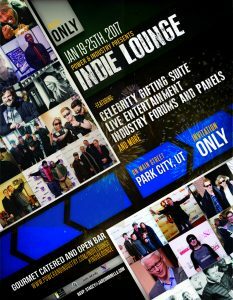 Located on Main Street’s coveted Marriott Summit, the #IndieLounge offers festival attendees an escape from the barrage of movie premiers and meetings. With an iconic presence, the #IndieLounge is widely known for their hospitable environment and full-service gourmet catering inserted in the background of this entertainment oasis.